If you’re a pumpkin fan, the odds are good that you’ve enjoyed pumpkin cakes, cookies and cupcakes, in addition to pumpkin pie. 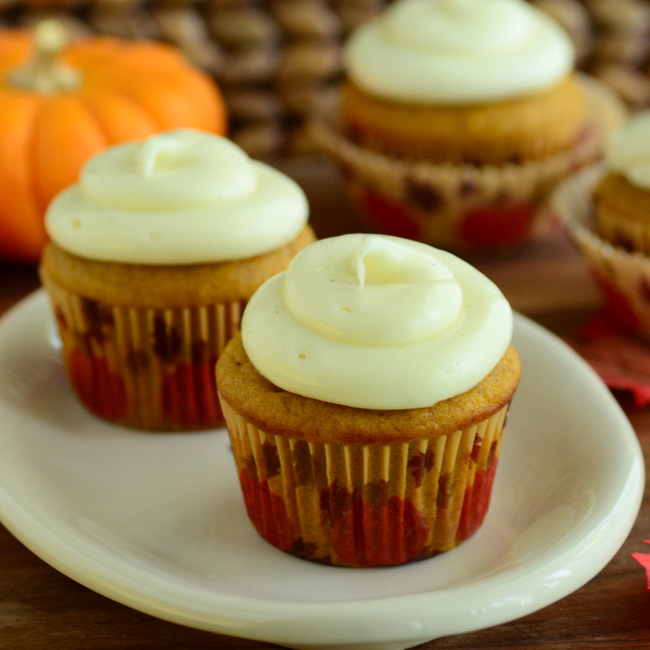 I’ve had some good ones and some less-than-good ones, so I can say with confidence that these just might be the Best Pumpkin Cupcakes you can make! 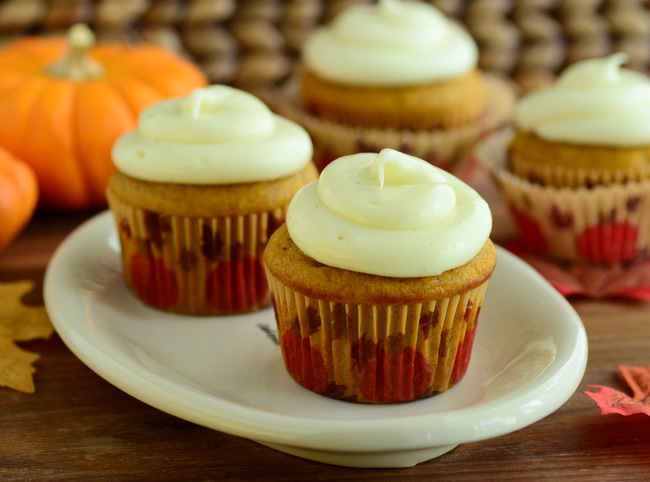 One problem with pumpkin cakes and cupcakes is that they tend to be overly dense and heavy. After a few bites, they almost feel like a chore to eat. This sometimes happens with carrot cakes and banana breads, too. That is not the case with these cupcakes, however. They are surprisingly light, with a moist and fluffy crumb that packs in plenty of flavor without feeling heavy. You can clearly taste both the pumpkin puree and the pumpkin pie spices – cinnamon, ginger, cloves and nutmeg – in each bite. They cupcakes are not overly sweet, which means that they are even better when topped with a smear of cream cheese frosting. The frosting here is a very classic cream cheese recipe that I use all the time. I supplement the tang of the cream cheese with a generous dose of vanilla – use vanilla bean paste instead of extract to get some vanilla bean flecks into the mix – which is a nice match for both the cream cheese and the pumpkin. Adding a few dashes of cinnamon is an easy way to spice up your frosting, too, if you want something a little bit less traditional. This recipe makes a slightly bigger batch than some cupcake recipes. This is because I wanted to be able to use up a whole can of pumpkin puree in my cupcakes, not just a part of one. If you only have one cupcake pan, you can let a portion of the batter sit out while the first batch bakes, then simply spoon the leftovers into the pan once it has cooled down. The cupcakes can be stored for a couple of days after baking and they’ll remain nice and moist – but they probably won’t last that long, especially if you have some hungry friends and family to share them with. Preheat oven to 350F. Line 18 muffin cups with paper liners. In a medium bowl, whisk together flour, baking powder, baking soda, salt and spices. In a large bowl, cream together butter and sugar until light and fluffy. Beat in eggs, adding them one at a time, followed by the vanilla extract and the milk. Stir half of the flour mixture into the butter mixture, followed by the pumpkin puree. Stir in remaining flour mixture, mixing until everything is just combined and no streaks of dry ingredients remain. Divide evenly into prepared muffin cups. Bake for 18-20 minutes, until a toothpick inserted into the center of the cake comes out clean and the top springs back when lightly pressed. Turn out onto a wire rack to cool completely before frosting. In a large mixing bowl, cream together cream cheese and butter. Beat in vanilla and milk, then add in the confectionersâ€™ sugar gradually until the frosting reaches a smooth, spreadable consistency. Add a little extra confectionersâ€™ sugar for a stiffer frosting.